I hope you are all enjoying our Halloween week. Today I have a great personalised Halloween story book to show you and one to give away to one of you lucky readers! 'On Halloween Night' from Born Gifted is a lovely story which teaches children that there is nothing to be afraid of when it comes to make-believe monsters and tales at Halloween. Gracie is quite timid and frightens easy, especially at Halloween! Luckily after a few years of trick or treating and Halloween parties she is finally getting used to the fact that the scary creatures are children in masks. She loves getting dressed up for the occasion and watching child friendly Halloween movies. I think she really related to the story as it was like it was inspired by her! 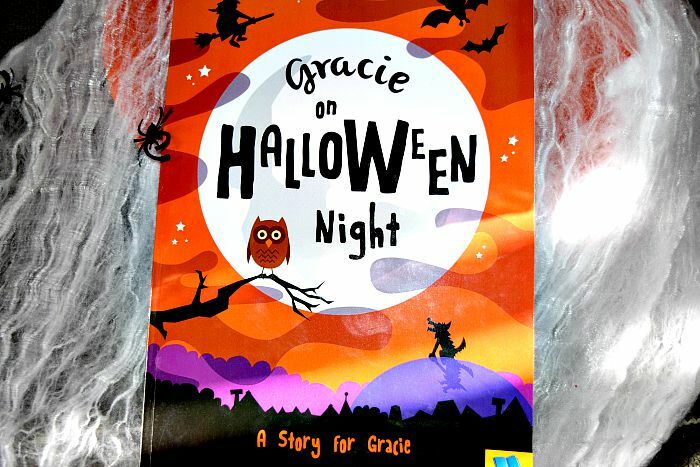 In the book, 'Gracie' goes trick or treating and comes across lots of scary creatures of the night. All the creatures we are taught are scary or bad but of course there was a happy ending, the scary creatures in the story book happened to be 'Gracie's family' so although the character was scared of what she saw when she was outside she realised at the end that things were not as scary as they seemed. It is a light hearted read, perfect for these dark nights that have suddenly appeared. It costs £9.99 which is a great price for a high quality personalised story book! Born Gifted have offered a personalised story book for me to give away to one of you lucky readers. To enter simply follow the instructions on the Rafflecopter form below. Don't forget to leave your name in your blog post comment so I know you have entered. Open to UK only. The competition will end 17/10/2015 at 12am. All entrants must complete the mandatory entry on the rafflecopter form. Those who don't will have all entries removed. The blog owner will choose the winner through the rafflecopter form (which uses random.org) The winner will be notified by email and displayed on the widget. One winner will receive a personalised Halloween book thanks to Born Gifted. No alternative prize will be offered. Allow up to 28 days for delivery. well, my 3 year old is super excited for halloween this year so he has designated costumes. i have to be a witch apparently! My husband, my toddler & I are all dressing up as old people this year. Normally we choose something scary but we don't want to frighten the little one! this year it will be my black wedding dress as im getting married!!! A bad fairytale character like evil Snow White.